Here's a nifty site to help you out with your website menu development. Free CSS Menus at the CSS MenuMaker! Simply choose a design from either Drop Down menus, Horizontal menus, and vertical menus. Then customize the text or additional menu items, then get the code! If you know how to read the code, you can also easily change the images and colours to better suit your preferences. 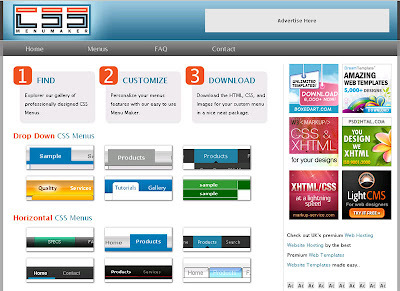 There are also a number of DreamWeaver CSS menus, but come with a price tag. Still, the free menus are worth a look.